My Scrappy Log Cabin top is finished, basted as shown here and tied with knots. The border is machine sewn as shown here. Folded and put in my quilting bag, ready to be taken with me tomorrow to our Monday's meeting, where I will sew the border by hand as shown here. I add this pictures for the ones interested in the knot method I used for tying this quilt. 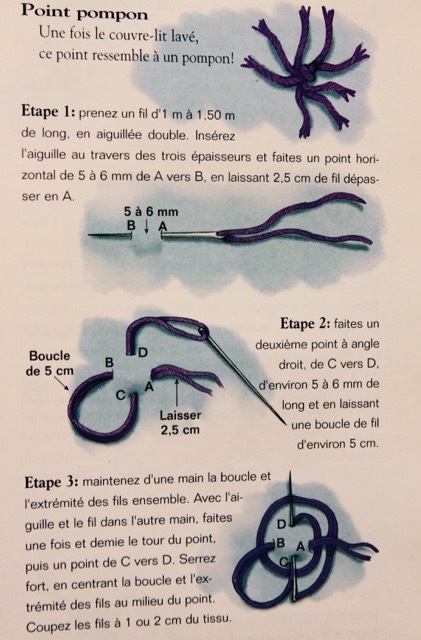 I found it in a French book, but I suppose you can find it in English on the web. Although it is understandable just by looking at the pictures. It is called the Pompom Stitch because, once the quilt washed, it will look like a pompom. What a fun detail to add to such a pretty quilt. I've not seen this stitch before, thanks for sharing it! Thanks for the pictures of the knot, I really like it. Sehr interessant, i shall put that under my favorites.mthanks for sharing. Bonjour Christine ! Merci de partager ta méthode de noeud ! Je la garde en mémoire, on ne sait jamais ! Interesting looking knot. I haven't seen that one before. What a great idea for a knot... step #3 looks tricky. 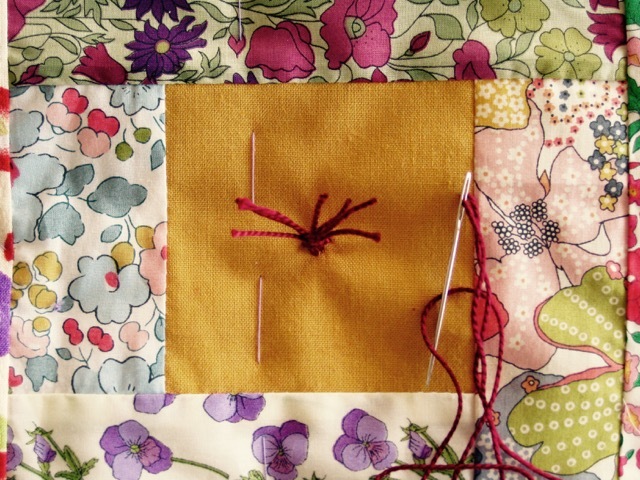 I would like to try knotting a quilt someday. This is one of the most beautiful log cabin quilts I have ever seen. I'll have to try that knot sometime, too...thanks for sharing. Another great tip on your blog. Thanks for sharing! I LOVE this Log Cabin quilt with sashings. I love the beautiful floral fabrics in your quilt. The pompom knots are a great touch. 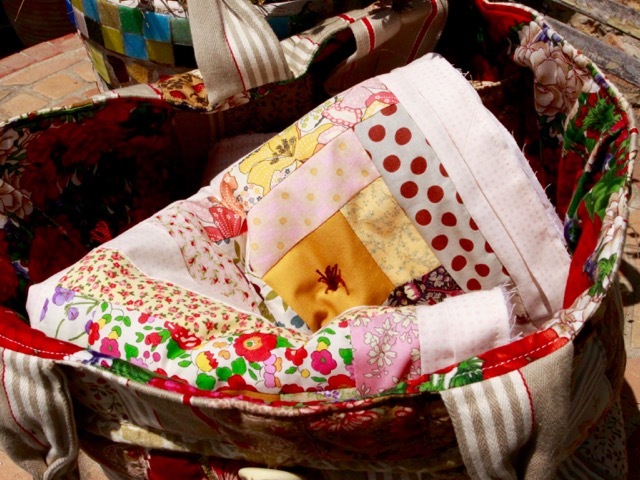 What fun fabrics you have used in your log cabin quilts! It is a testament to your stash! Yes, what a great knot, Christine, thanks for the instructions! And your quilt is beautiful. Great job! This is so much better than just a plain old knot. The diagram looks easy to follow - thanks for sharing that! Christine, your scrappy log cabin is so lovely! The golden centers and checked sashing tie all those gorgeous fabrics together perfectly! You have been very busy. I have never seen that knot, so thanks for sharing! Looking forward to the finial picture. Applause. It's wonderful and I will try these knots on a quilt too. Thank you. What a great way to add interest onto a quilt. I would love to try this next time I hand quilt a quilt. Thanks for sharing. 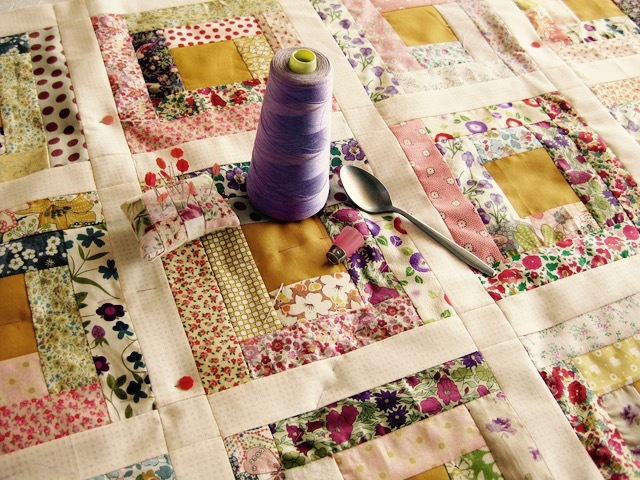 Love that Pompom Stitch - it adds a whimsical touch to a perfect quilt.